The SNP have once again slammed Lib Dem plans for extra powers for Holyrood as an alternative to independence. 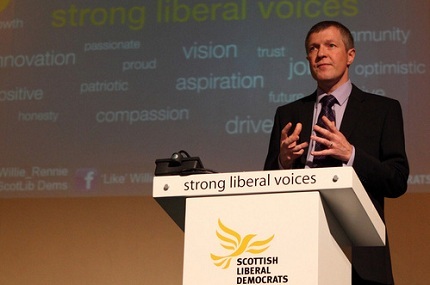 In the wake of Lib Dem leader Willie Rennie’s conference address in Dunfermline, which highlighted the party’s home rule policy, on Saturday a SNP spokesperson said: “The Lib Dems have been proposing Home Rule for one hundred years – how many more talking shops do they need? “Far from being a way to achieve more powers for the Scottish Parliament, people are becoming increasingly aware that a No vote will roll back the achievements of devolution through continued Westminster austerity. In his address Mr Rennie stressed that he saw home rule as a viable option saying: “Scotland has an alternative. “If we want to keep our influential place in international bodies, but with strong domestic powers, people don’t have to look very far from this room. The chairman of the committee responsible for the home rule proposals, Sir Menzies Campbell MP, claimed that they were a natural progression from the current devolution set-up. He said: “Since 1999 when devolution was in its infancy the Scottish Parliament has matured and grown in strength and authority. The time has come for it to move to a fully-fledged partner as a Home Rule Parliament within a federal United Kingdom. The Lib Dems policy will not be able to be considered until after the 2014 independence referendum as there will be no second question regarding extra powers for the Scottish parliament. Scottish Lib Dem leader, Willie Rennie has spoken in support of the ‘Federalism: the best future for Scotland’, report from the Scottish Liberal Democrat’s Home Rule and Community Rule Commission. The report claims that a form of enhanced devolution, with Scotland given full tax varying powers, within a federal United Kingdom is the best way forward for Scotland. At the launch of the report, which would see the historic Act of Union between Scotland and England being scrapped and replaced by a declaration of federal union, commission chairman Sir Menzies Campbell MP claimed that the current devolved set-up was “unsustainable”. Mr Rennie stated that his party’s vision will serve Scotland better than the SNP’s independence policy. He said: “Our ambition is to improve the social, environmental and economic well-being of Scotland.